“Did You Know” that AcuSolve requires a single topology and parent volume for each Simple BC, Element BC, Surface Output, etc. command? This becomes very important when using mixed-element meshes. For example, if you have an inlet surface that has trias and quads, this will get written as two separate Simple BC commands – one for the trias and one for the quads. So if you use a mass_flux, flow_rate, or average_velocity inflow type, you’ll get the defined value for the inlet set of trias and that same value for the inlet set of quads – effectively yielding a higher inflow than desired. You’ll also get a strange inlet profile – the computed profile for the trias and the computed profile for the quads. There my be other Surfaces where this topological separation creates undesired effects as well. There are two suggestions to handle this. 2. 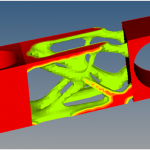 If you really want to use a mixed-element mesh, then it’s better to use a velocity inflow type and define the constant velocity components, or use User Function to define the desired profile.